The unthinkable refers to actions so bad, so shocking, so reprehensible that they are not even worth thinking, leave alone intending to do, and leave far alone actually doing. And yet the mind can make us do such unthinkable things. How does it make us to do such things? By sweeping us away with its storm-like currents of desires. 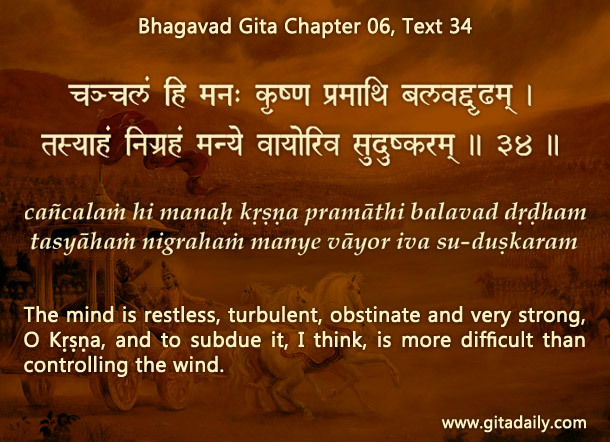 The Bhagavad-gita (06.34) points to this fearsome power of the mind by stating that it is as forceful and irresistible as a raging wind. When it carries us away, we act impulsively, recklessly, unthinkingly. Just as people caught in a storm don’t stop moving, but are moved in a direction different from where they wanted to go, similarly, under the mind’s spell, we don’t exactly stop thinking, but we think not according to our values and purposes, but in ways contrary to those values and purposes. Areas where storms occur frequently build storm shelters, often underground. We too need to build inner shelters for protecting ourselves from the storms that are set off by the mind. These storms can be triggered either by the subconscious impressions that arise from within for no apparent cause or more frequently the conscious perceptions that rush into the mind from without. Whatever way the storm is triggered, the important thing is that we find ways to protect ourselves. Whereas protection from physical storms requires physical motion from the pathway of the storm to the shelter, protection from emotional storms requires emotional motion from the source of the emotional turbulence to a source of emotional tranquility. The best such source is remembrance of Krishna, the eternally unchanging reality. The more we strengthen our emotional connection with Krishna through the practice of bhakti-yoga, the quicker we can avoid the mind’s storms, and stay purposeful and eventually become successful. Very nice explanation of the verse.